Tributes to John McCain came from loved ones, longtime allies, and former political foes. Unafraid of contradictions, McCain himself had campaigned against Obama’s health care law, but voted against its repeal because Republicans had flouted what he called the ‘‘old way of legislating,’’ with full-fledged debate, amendments and committee hearings on the final bill. President Trump tweeted Saturday night, saying that “our hearts and prayers are with” McCain’s family. “All of us can aspire to the courage to put the greater good above our own,” Obama said in the statement. 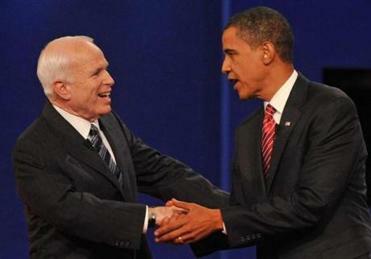 After surviving the 2010 election, McCain wasn’t about to roll over on any number of other issues. During a long and heated 2011 debate in Congress over the federal debt, McCain dismissed conservatives’ arguments against raising the government’s borrowing limit as ‘‘bizarro’’ and foolish. In a 2014 hearing, he lit into Secretary of State John Kerry for ‘‘talking strongly and carrying a very small stick — in fact, a twig’’ on foreign policy. ‘‘I think John’s legacy is that he never quits,’’ Biden said in a 2015 interview. ‘‘Now it will be very bad for you, Mac Kane,’’ they told him, and they were true to their word. Even in prison, McCain played to the bleachers, shouting obscenities at his captors loudly enough to bolster the spirits of fellow captives. Appointed by the POWs to act as camp ‘‘entertainment officer,’’ a ‘‘room chaplain’’ and a ‘‘communications officer,’’ McCain imparted comic relief, literary tutorials, news of the day, even religious sustenance. Still, a predilection for what McCain described as ‘‘quick tempers, adventurous spirits, and love for the country’s uniform’’ was encoded in the family DNA. His father and grandfather, the Navy’s first father-and-son set of four-star admirals, had set such a low standard for behavior at the Naval Academy that John Sidney McCain III’s self-described ‘‘four-year course of insubordination and rebellion’’ got little more than a yawn from his family. His 1981 marriage to Cindy, the daughter of a wealthy beer distributor in Arizona, helped clear the path forward. In one day, McCain signed his Navy discharge papers and flew west with his new wife to his new life. By 1982, he’d been elected to the House and four years later to an open Senate seat. He and Cindy had four children, to add to the three from his first marriage. Their youngest child was adopted from Mother Teresa’s orphanage in Bangladesh. McCain set about establishing a conservative voting record and a reputation as a tightwad with taxpayer dollars. But just months into his Senate career, he made what he called ‘‘the worst mistake of his life.’’ He participated in two meetings with banking regulators on behalf of Charles Keating, a friend, campaign contributor, constituent and savings and loan financier who was later convicted of securities fraud.